Get a cardboard box, paint it silver, sit in it and pretend youre Kirk. There, we just saved you some cash. What is it? 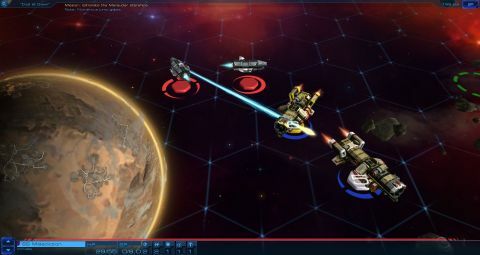 Turn based strategy game about exploring the galaxy with a fleet of custom ships. When I think of starships, I think of SF book covers. I think of impossibly-tall silver spheroids drifting over mountains, of rusting hulks trapped between the stars, of nippy fighters with barely enough room for life support scraping between asteroids. I think of the glories of Eve, Homeworld, Alien: Isolation, and Elite. This Starships launches in a small window and has cruelly little ambition. Rather than the ethereal beauty of my SF dreams, Sid Meier’s Starships is a sub-GalCiv casual game, almost certainly designed with mobile as the lead platform, like its superb predecessor Civilization: Revolution. It’s an extremely cutdown version of the Civ formula, but despite the similarity it doesn’t share Revolution’s charm, looks or innovation. You start at the end of Beyond Earth—apparently it also unlocks content for Beyond Earth, but I couldn’t find how. Choosing your faction and leader provides you with bonuses (which you’ll forget you have the moment you leave that screen), and you’re left looking at a very simply-modelled image of a few planets with inexplicable numbers all around them. An information pane pops up, telling you a few basics, but there’s no formal tutorial. Luckily, the game is so simple (as evinced by the absolute lack of graphics options) that a tutorial is mostly unnecessary. On this galactic map, you improve planets and send your (single) fleet around to take quests to take over planets. Each planet has mildly different characteristics, resulting in different production of the four resources, different ship upgrade prices, and the potential to build a wonder at many of them. Despite that, their balance is off. One fast-growing planet I found supplied more than the rest of my empire with every resource, enabling me to win just by building wonders. At this level you can also conduct the most limited diplomacy I’ve ever encountered in a game. You can get information from your characterless enemies about their ships and empire, with no explanation as to why they’re telling you all their weaknesses, or you can declare war. That’s it. The research tree is similarly rudimentary, acting as straight upgrades to your weapons and tech, without explaining how they differ from each ship’s individual upgrades, while the wonders are more fun if even more unbalanced, giving hugely overpowered bonuses in combat like lasers with infinite range or the ability to fire invisible torpedoes or take two actions for each ship. Now, in the similarly dual-level Total War games, the often-weaker campaign meta-game has always been carried by the peerless battle engine. That’s not true of Starships; while the quests always sound interesting, they boil down to turn-based battles on a simple 2D plane, normally packed with static asteroids, wormholes and planets to act as terrain, where you deploy the same fleet over and over. The enemy ship AI is solid enough, using its weapons effectively, but on normal difficulty it leaves them open to attack too often, the coolness of the torpedo and fighter mechanics can’t defray the boredom of doing the same thing over and over. Your fleet is probably the game’s sole redeeming feature. You have a handful of ships, and you can upgrade each of them in multiple ways (though the costing balance is, again, a bit off). like Luftrausers, as they improve they automatically change their name and appearance to reflect their new role; a ship with large engines and plasma cannons would be a Fast Assault Corvette, whilst one with heavy armour would be a Destroyer. Oddly, even if these ships are destroyed in battle, they can always be fully repaired afterwards, so all the empires’ fleets are getting relentlessly stronger as the game goes on. You can also use randomly-dropped cards to give your ships temporary boosts or build wonders that act as super power-ups. Again, it doesn’t seem very balanced; I found a cheap tactic with massed fighters and a wonder that let them pass through asteroid fields and rarely lost a battle or even a ship after that. At the time of writing, the game is also struggling under a mass of bugs, reinforcing the feeling it’s been booted out of the door willy-nilly. Many players can’t start it at all; others suffer from game-breaking flaws (like quest planets that give a thousand times the resources they’re meant to), disappearing asteroids or odd graphical bugs. In my games, destroying a ship results in a prolonged juddery animation loop familiar from crappy games of the 90s. I could build cities when I had no food to build them with. Even the options in game creation don’t work properly, allowing the AI to win using supposedly removed victory conditions. Starships isn’t terrible, but it isn’t the polished product you’d expect from a studio with Firaxis’ history. Comparing it to its full-scale PC competitors, like Endless Space and GalCiv is cruel, as it’s sub-par in every single regard: unbalanced, repetitive, badly explained, rather ugly, with a dreadful mobile phone UI, and buggy as hell. Even judged against Firaxis’ other mobile games, Civ: Rev and Ace Patrol, this is small and crude.